Descending the few steps that lead to the ‘In Residence’ basement space of Galleria Franco Noero, you might think you had walked into a construction site. The room smells of wet concrete, a concrete mixer is in the corner and wooden boards are leant up against the walls. In fact it’s all part of a new installation by Mike Nelson entitled ‘Procession, process. Progress, progression. Regression, recession. Recess, regress.’ Its centrepiece is a kind of ‘carpet’ made of concrete and steel, which the British artist has created by imprinting original timbers from wooden Ottoman-era buildings in Istanbul onto the wet concrete. The installation reprises a project Nelson developed in 2009 for the Akbank Cultural Centre in Istanbul, which in turn had been a preparatory work for a proposed, yet never realized piece destined for the 2003 Istanbul Biennial. Nelson’s original intention was to take a derelict Ottoman wooden building and use it to cast a brutalist concrete structure: a tribute to a putative form of ‘Kemalist modernism’. In the artist’s view, it’s astonishing that the political turning point marked by the end of the Ottoman Empire was not matched by a parallel shift in the country’s architecture. Nelson carried that narrative forward to 2011, when he famously turned the British Pavilion at the Venice Biennale into a simulacrum of a 17th century Ottoman caravanserai. Throughout his career, Nelson has often returned to previously worked narratives and installations. Maybe this time he deliberately sought to dig deeper into Turkey’s current state of affairs; or maybe he just wanted to confront the viewer with a feeling of displacement. What is certain is that despite palpable similarities, the 2009 installation and this one are two very different pieces. 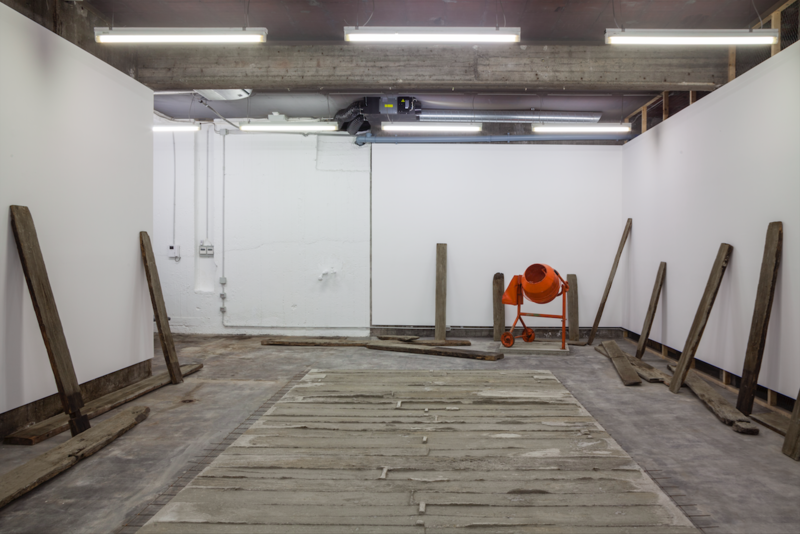 In the catalogue accompanying Nelson’s 2011 British Pavilion, Dan Cameron insisted that ‘above all else, [the caravanserai built into the pavilion] is most categorically not the artist’s reconstruction of a place that existed before in another time and location.’ The same rule may apply here: by re-imprinting the planks onto cement, Nelson is not merely echoing his original gesture but is adding yet another reflection to an ongoing mise en abîme. The artist doesn’t seem to be interested in merely travelling back in time but rather in discovering means of accessing parallel realities. Upon leaving the ‘In Residence’ space at Galleria Franco Noero, one is left with the impression of having visited a place where the past, the present and the future have been combined, as if they were the cement, gravel and water in that concrete mixer in the corner.